Former heavyweight champion Mike Tyson has had more professional chapters than a Harry Potter novel, but his latest venture might have some staying power. On December 20, 2017, Tyson and his business partners, with shovels in hand for the cameras, broke ground on a forty-acre cannabis … something. Part resort, part retreat, part trade school, part health center, Tyson Ranch intends to offer a little cannabis for everyone. Cannabidiol, popularly known as CBD, has proven effective to help alleviate some cases of post-traumatic stress disorder among veterans. Located in California City, a small blip on the map in the middle of the Mojave Desert between Los Angeles to and Death Valley, Tyson Ranch is just a short drive from Edwards Air Force Base, the nearest major landmark. Today, California City has a total population of almost fifteen thousand. North of town is a Honda car-testing facility and test track. To the east is a boron mine, the largest open-pit operation in California. And to the south is the Air Force base, the region’s largest employer. In recent years, especially once the writing was on the wall that California voters would approve recreational use, city officials have sought to boost the local economy by welcoming marijuana-related businesses. So Tyson Ranch has the unqualified support of California City. Current plans call for Tyson Ranch to set aside twenty acres for the cultivation of marijuana by “master growers,” who will also offer classes at the ranch’s cultivation school to teach other growers how to improve the quantity and quality of their crops. There will be an edibles factory, an amphitheater for entertainment events, a hydro-feed plant and supply store, extraction facility, and campgrounds and cabins in areas reserved for “glamping.” When all is up and running, it may be the first cannabis-themed desert resort. 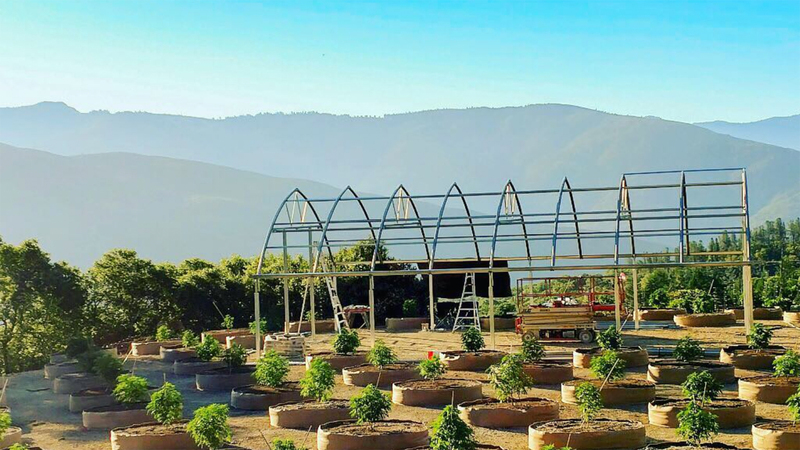 If Tyson Ranch’s build-it-in-the-middle-of-nowhere-and-they-will-come bet pays off, it could be the start of a cannabis travel industry. By combining Oaksterdam University-esque educational opportunities, a mind-body-spirit healing center, and a high-end, all-things-cannabis resort experience, Tyson says he wants the ranch to become a sanctuary for cannabis growers and consumers alike. California City officials are all fervently hoping from Iron Mike’s mouth to God’s (unbitten) ears that their small town will get a piece of the green boom pie. At the groundbreaking ceremony, Mayor Jennifer Wood acknowledged the ranch would help provide a rebirth for the town, which initially had lofty dreams during mid-century development. Tyson, who has long been candid about his marijuana use, says the ranch is more than just a business opportunity or a recreational hangout. He sees it as an avenue to promote the benefits of cannabis in general, as well as CBD’s ability to improve health and wellness for everyone, especially military personnel. While a firm opening date has yet to be confirmed, Tyson’s team says California City’s undeveloped lands were “primed to be cultivated” and is convinced the ranch will become a sought-out oasis in the desert. While this may be the latest development in cannabis tourism, the market has been used for some time now. From Emerald Triangle tours to cannabis-friendly getaways, Tyson’s ranch is only one option in the ever-expanding market of canna-travel. Make sure you research ahead of time by finding out what local laws are in the area you’re traveling to, as well as some best practices for traveling with cannabis.